On paper, Dawn Russell has the kind of life reminiscent of a modern-day fairy tale: An American model meets British royalty, falls in love, gets married, and moves to London, where she now resides happily with her husband and two sons. But every fairy tale has a twist, and Russell’s was more sobering than most: In her mid-20s, she was diagnosed with stage-three cancer, which immediately put her modeling days behind her. The runways of Ralph Lauren and Donna Karan were swapped for the hospital bed, and upon her fourth surgery, Russell developed a serious bone infection that weakened her to the point where chemotherapy and radiotherapy were no longer viable options. But a true heroine never gives up, and neither did Russell. She took matters in her own hands and started doing her own research, traveling all over the world for alternative treatments, nurses and IV tubes in tow (and subsequently meeting her future husband, Lord James Russell). It was during her recovery that she started noticing a pattern: Consuming greens like spinach, kale, and something called blue-green algae (more on that later) directly correlated how she felt. The more greens she had, the less nauseous and weak she was—and she knew it wasn’t a coincidence. Thus, 8G was born—the fizzy green tablet that wants to replace your juice addiction. I met with Lady Russell on a balmy morning in Los Angeles to learn more about this supplement, and how it may just change the way we consume greens forever. Keep scrolling to learn about 8G! 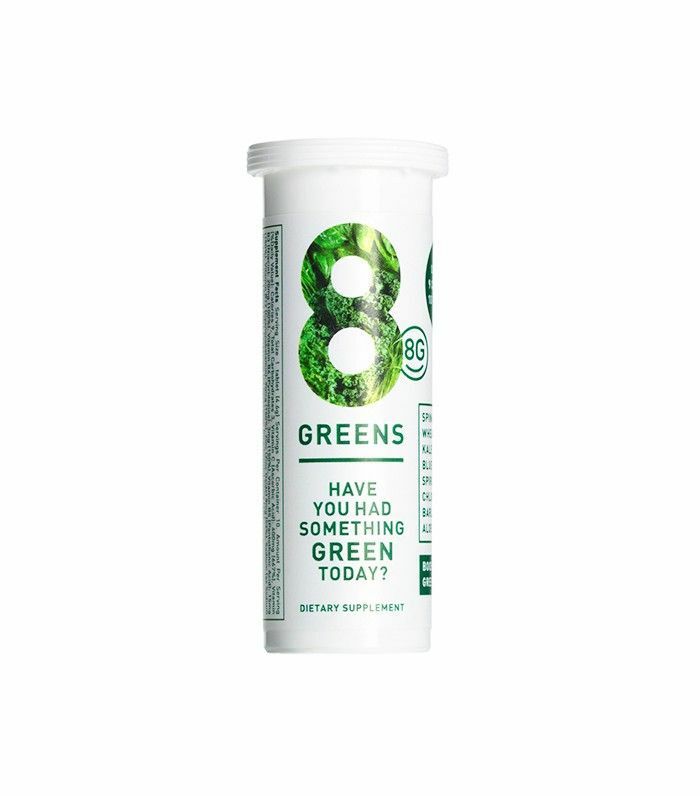 According to Russell, 8G is different from other supplements because it tastes delicious (I can personally vouch for this), has zero added sugars, and is just nine calories—all of that on top of the fact that it gives you a big dose of eight essential greens in just a few gulps. “I created 8G because I wanted to make getting greens easy, tasty and affordable,” Russell tells me. “Not everyone has the time to make a green juice, a smoothie, or make the healthy choice with their nutrition.” Like other fizzy drinks, all you have to do is drop it in a glass of water (the colder, the better in my opinion if you care about taste), let it fizz, then drink it. And that’s the beauty of it—unlike juicing or making a smoothie, it’s totally mess-free and perfect for people like me who roll out of bed bleary-eyed and barely have time to brush their hair before rushing out the door, much less operate a juicer. In case you haven’t deduced it, 8G stands for eight greens, and those eight greens have all been hand-selected by Russell. “I wasn’t going to make 8G unless these exact eight greens were included, particularly the blue-green algae,” she says. “As my doctors have stated, blue-green algae is commonly known as the most powerful green there is as it is the only 100% non–man-manipulated green.” She explains to me that when she was extremely sick, she consumed high amounts of these nutrient-dense greens and called their effect on her body “truly life changing.” “I would be almost dizzy by 10 a.m. from how debilitated my body was, and using large amounts of blue-green algae was the first time I could make it to lunch and not have to cancel every single dinner plan,” she says. The other greens in the tablets are spinach, wheatgrass, kale, spirulina, chlorella, barley grass, and aloe vera, which go through a process of dehydration to be condensed into the tablets; other ingredients are ascorbic acid; niacin; vitamins B3, B5 and B12; zinc; sodium bicarbonate; and potassium bicarbonate. The thing that really sets 8G apart, however, is the price: It’s just $12.50 for 10 effervescent tablets. Compare that to just one cold-pressed juice, which can range anywhere from $6 to $15 per bottle, and you realize how game changing this supplement is. “I am very proud of it because I fought long and hard to get it to $12.50 per tube,” Russell explains. “It was originally over $100, and the suppliers thought they had given me a miracle by getting it to $60.” By committing to buying larger bulk and more or less threatening to go to their competitors, Russell got her way—and we can all reap the benefits. Her customers praise 8G for things like helping their picky kids get a boost of essential greens to improving their own skin and energy levels. I personally can attest to both 8G’s tastiness (it’s sightly sweet, and tastes more or less like a soft drink) and ease of use. In fact, as someone who’s not that into drinking water (I know, I’m terrible), 8G has actually made me drink more water because it makes plain water taste better. It’s hard not to drink the Kool-Aid (or rather, green juice) when you’re sitting across from Russell, who is now the picture of health with her glowing skin and lissome frame—and after hearing her story, why wouldn’t you? Have you heard of 8G? Speaking of supplements, here are 10 more we can’t stop raving about.